I need caffeine, a foot massage, and a neck support. In that order. My hands are doing surprisingly well though, even if it hurt so much I was almost crying last night. They are less stiff than they usually are in the morning. Dunno why my right foot decided to act up, maybe the hands sent their stiffness there to be localised in the toe joints. Belayed clarification: I went bowling with work. My mother asked me what I want for christmas. I opened my mouth (metaphorically, as it was a written question online) to answer and then shut it again. Last year my only christmas gift was the one from work, sitting in lonely majesty under my christmas bamboo. I knew what it was cause those rude fuckers at work tore open theirs right in front of me. Still. So I compiled a wishlist for her. Here you go Mum - you can pick one or more items and surprise me. Linus missed me very much, he was quite upset when I got home. Too bloody long away, from dark until the next dark! Work was ok. They gave me cake. It is the last night of my vacation. It has been good. I haven't accomplished as much as I had hoped but I have rested. Even sleeping quite alot longer than I usually do. Now the clocks are reset to normal time, and my working year will start tomorrow morning. In a week there is a new fiscal year too, so one week of catching up with everything from my month of absence, as well as preparing end of month+end of year documents. I am not sure if I am looking forwards to getting back to work - while the absence hasn't been long enough to stop me from thinking about work daily and dreaming about it nightly, it has been long enough to get some perspective. But I expect that in a week or two I will be just as focused as usual, living for my job. And I am not all that sure that is a bad thing, even though a lot of people seem to think so. So how did I spend the last day of my holiday? Laundry, folding away laundry, tidying up a bit in my bedroom, vacuum cleaning, cooking some lunches for the coming day, generally clearing out rubble so I can have a bit of a fresh start of my year. Also I watched an episode of Midsomer Murders, finished knitting a lonely mitten (I have not enough yarn for the second), and tried to solve a crossword in Swedish, and re-read Nick Sagan's "Idlewild". Not a very exciting finish but one that feels satisfying enough! 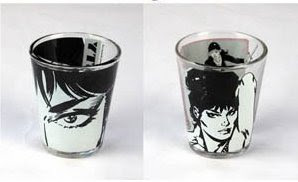 I have e-mailed the company that had these and asked where they can be bought, I will have to get back to you with that information. I sometimes see things that awakens a strong desire in me to own them, to use them daily. A shape, colour, pattern, use - mostly a combination. I am a firm believer in the fact that useful things should also be beautiful (resulting among other things in my latest useful purchase; a bright pink bucket - 2009 pink ribbon edition from Vileda). This is also part of the driving force that makes me try to make things myself instead of buying them if it is within my power - I like my own design! My latest infatuation is with a teapot from a Swedish designer, Gustav Kristensson. 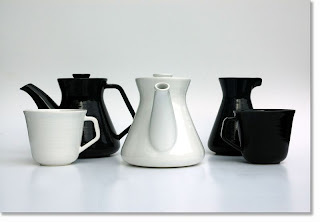 The series Halv åtta contains tea pot, jug and cups in stoneware. According to various press releases it comes in two colours (black and white) but I see photoes of it in two further colours, a blue grey and a heather colour. The company Vardagsbruk seems to share my philosophy of usefulness and beauty combined - Silme stamp of approval! I really, really want the tea pot. Unfortunately it is apparently not in sale anywhere yet Edit: But it will be in sale from december, in Stockholm at Tehuset Java @Odenplan. Maybe just as well, because I am at the moment unable to decide which colour of the four I like best! If I were to get only the pot, probably white or maybe blue to fit in with everything else I have, but I also like the jug and cups, and if I were to get pieces from it all I would like purple or black - or maybe mixing them.. CRAVINGS! I had set the alarm to 7.00, in an attempt to get used to early mornings before I get back to work next week - and I managed to summon the discipline to get up then too. However it was DARK and rather cold as well, and I wanted to go back to bed. Solution; turn on all the lights in the bathroom and take an hour long hot bath. When I came out the grey light of dawn was starting to penetrate my flat. I am really looking forwards to setting the clocks back an hour - lighter mornings! I know it won't last long but it will give a few weeks respite at least. A cup of tea and fresh baked bread rolls for breakfast. And some photos from my living room window, taken this morning. I've been undecided about the H1N1-vaccine all summer and autumn, but sometime last weekend I decided I want to take it. The reasons are multiple and complicated, but I will try to sum them up here, in no particular order, since I have been asked about my decision and gotten very varied responses to the decision. It surprises me that people are so ambivalent to a vaccine. It is based on the same vaccine used for the yearly flu, there is not much new about it in that sense. The differences from a regular flu has been blown up in media but most importantly it is likely to be an illness alot, ALOT, of people get if it does start to spread for real. It isn't necessarily bad compared to the regular flu (most people find it a milder variation), but you know that time of year when it seems everyone you know has the flu? This is going to hit more people than that. Means its a bigger chance you get it yourself. - I just can't afford to be ill. With the current Swedish system I lose all pay for the first sickday and thereafter 20%. If I get away mildly that is a weeks absence and the equivalent of two full days salary. Alot of money to me. I already was ill one time this autumn (bit over a week), I haven't seen the paycheck yet but I can openly admit I feel some trepidation. - I have asthma. A regular flu is likely to knock me out for not just for one, but two or three weeks with various breathing problems or lung-related side infections. This one has been harder on the respiratory systems of those with similar problems. - I was kindly informed by the nurse that my arthritis goes into the same category as HIV and cancer in this case: An autoimmune disease that makes me more likely to get severe problems and side infections if I get ill. So in the risk category two times. - The side effects are about the same as the regular flu shot every year. I've gotten that once with no ill effects, on the contrary, I am very glad I got it because it changed my life. One winter without flu gave my immune system time to recover so that by next winter it could fight the battle, and I have been much healthier overall since that, not getting knocked out completely by colds/flus 5-10 times a year. So I figure I am not likely to suffer anything much worse by this. And afterall, it is free (for the stockholm residents anyway) so I am not losing anything on it. And then there are the oft-repeated argument: If as large a part as possible of the population gets the shot the virus wont be able to spread and it will protect alot of people. It will also mean fewer of your coworkers get ill and your workburden won't increase to cover their absence. I was down at the HC anyway for a cancer screening monday, and it happened to coincide with the drop in hours for getting the vaccine (right now only health personell and the risk groups are getting the shot, VIP in the line so to say). But the waiting room was so overfilled with people wanting the shot that I couldn't stand it - and not waiting for what would probably be hours either - so I went home. Then I, typical of me, forgot all about it until wednesday night. So I checked the opening hours for the rest of the week - thursday morning, thursday afternoon and friday morning. I tried for this morning but failed miserably due to being frozen and tired from not getting enough sleep due to waking up from shivering under my duvet (need an extra heat source...). After lunch I was down there shortly after they opened again - and right about time too, I got the 6th to last dose they had! They won't get refills until end of next week, and apparently they are out all over stockholm. Talk about luck. So dose 1 gotten, the second dose to be gotten end of november. Side effects? Yes, but I am not sure what is arthritis acting up because of me being chilled and what is due to the shot. What I know is due to the shot is a muscle knot around where they stuck the needle in my arm which feels like a bad bruise if I accidentally bump it against something. But yes, I really, really, really want to get warm and Linus just isn't big enough to do much for heating up my bed. He is freezing too. My balcony looks more like a warzone than ever, but it is actually just the cleaning left. Everything is sorted; most of what is to be thrown away (dead plants, cuttings, random detritus from planting) has been, the roses are winter covered, the various pots and planters that are to be taken indoors for the winter (and washed) are sorted out and stacked separately, and I have set 30 tulip bulbs, 20 double narcissus bulbs, and 10 snow drop bulbs. Several hours spent outdoors sitting in spilled earth and on cold concrete - I was glad to get indoors and get changed into warm, dry and clean jeans! Now I will make spinach-feta pies. Hungry! What are you going to/did you eat? Double sided (and based on a wish by the recipient and my knowledge of her). And the robot is there too, but for some reason only its legs are visible in the photo. It must have hidden out of fear of the camera. The cat figurine on the shelf above my new monitor (thanks Mum!) I made when I was 19, using a raku oven (wood fired oven where you put the dried item in - you have to mix alot of sand into the clay so it will take the sudden heat change of being put in then taken out and dunked in cold water). The cat is nicer when it is in focus and you can see the details. Already snow on the mountain, I am sure skiing fanatics are happy. Below my mother and my grandfather, both very good people. My grandfather is 2,5 months short of his 101 birthday. His hearing unfortunately isn't very good, and he just can't be bothered to use the gadgets he gets for it, but he seems to be as lucid as me for all that it is two one-way conversations. I keep saying that moving into a flat where I live alone and being long-term single has been the best thing I have ever done, but in all fairness to past flatmates and cohabitants, girl- and boyfriends, I have mostly become alittle better with each change to my life, be it a move or a new person. And every time it has seemed that this was really good for me and such a major difference compared to what came before. There was alot of things that came before, that slowly worked in me and finally imploded. Other people involved got a delayed reaction about the same time I did. It was easy with short hindsight to blame other circumstances, people, events, actions for what happened but I think the main cause came further in the past; simply because of the simultaneousness of our - identical - reaction. Also alot of my decline was not really observed and seen because of my "fluffy" art year where not much was achieved except some crafting skills - I was hidden and unobserved there, spiraling ever down, and when I came away it was easy to blame other things, the changes, the new people in my life. Belayed apologies. Today I am at my best so far. With every big change (new relationship, new job, big house move) the observation have been made that now I am finally well - yet the same thing is said - by me, by others - the next time. I think I am still getting better. Observing I think others have made a speedier recovery but I know how well I pretend myself, so I should give them the benefit of the doubt - they might be in the same situation. Day by day. This week was better than the same week last month. What a difference to last year. But still a ways to go. I see ways in which I have become worse the past year and a half too. My self confidence has moved back ten or twelve years in many respects - which makes me more shy and reserved. At the same time I know I am good at things and I respect my own skills. So it is mostly a social matter, and more based in genuine shyness than irrational fear. So still an improvement. Still something I wish I could get over. Five years ago I was still making friends, getting to know people, meeting new people. That has become more and more rare, to the point where I am now refusing or at least making excuses, avoiding, to meet what could/should be fairly good friends because I think they cannot possibly like me IRL. I promise not to delete this post or any paragraph in it no matter how much I might regret being that honest in five minutes time. It is needed. Edit: It is wednesday evening the 14th when this was posted. I tried scheduling it to post tomorrow; but it came up instantly - with tomorrow as post date. PLEASE don't use IE to view my blog. It looks awful. Sometimes I outright hate blogger. I hate that the pictures come all haphazardly, with strange steps between them that I can't get rid of. I hate that they always wind up in a different, random, order to what I upload them. I hate that it is nigh impossible to write text in the same post you have pictures without the text also becoming as jumbled, and that moving the photoes around requires me trying three different browsers until I find one that will let me do it, and then they get more jumbled than ever. Slight design change. Whatcha think? Today's dinner in its VERY early stages. Linus, Pepper and Ole Einar. Linus of course travelled with me. Last tuesday I was in Norway and it snowed - but the morning after the weather was fine again.